Three men in a pub talking about astronomy. This episode Dave and Mike are joined by John Slinn, founder of “Disciples of the Dark Arts” which is a Guildford based Satanist Club astrophotography group! 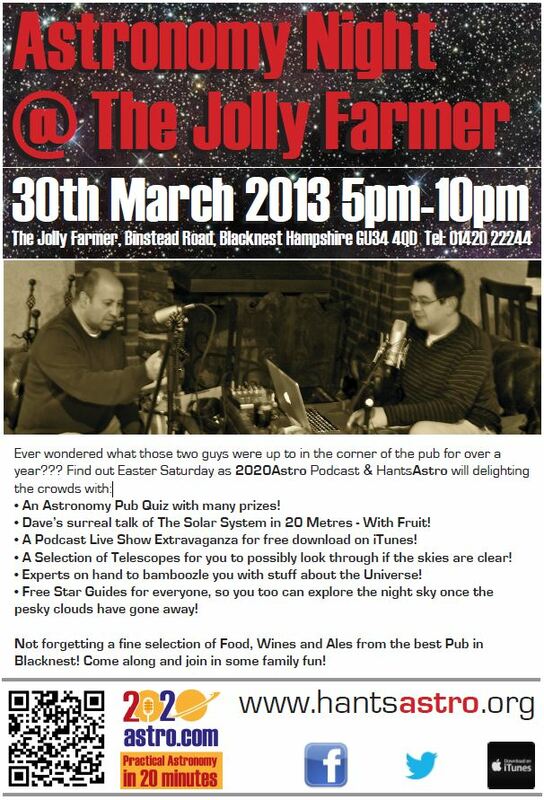 This Saturday 30th March 2013 at the Jolly Farmer, Blacknest. Mike and Dave nearly go all sensible for once and discuss combating Dew, heaters* power options for your mount and Mike’s obsession with heated clothing with lots of pockets. And we thought all along he used them for keeping his eyepieces warm… How wrong can you be. *Dave actually lost his dreadlocks at the tender age 34, and had to sell his ageing collection of vintage hair dryers as none were 12v. Since then, he’s just keeps a can of Frizz-Ease. Just in case.